The new generation of iWand 2+ is a portable, light delivered acupuncture healthcare product that improves body microcirculation, promotes metabolism and strengthens immunity for your better health. With a simple touch, the protonic light of iWand 2+ helps in pain relief, encourages rapid recovery of infections and wounds and expedites the skin’s absorption of skincare products and other ointments. In Traditional Chinese Medicine, impeded microcirculation will manifest into pain or illnesses, which essentially raise the alarm about our body condition. Headache, neck and shoulder pain, back pain, knee pain, muscle aches, and menstrual pain are unbearable, affecting our work and life. Point iWand 2+ at the area of pain can quickly re-establish the meridian flow and relieve pain in a short time or even minutes. iWand 2+ can relieve various kinds of pain and common illnesses including constipation, indigestion, common cold, coughing and other chronic conditions. The effect of iWand 2+ is faster than ever before. Point the contactless protonic light at the corresponding acupoints to enhance the Qi (i.e. energy of life in Chinese medicine) in the body. Applicable for all areas including infected areas, wounds and hair covered areas. Poor microcirculation manifest into pain or illnesses. 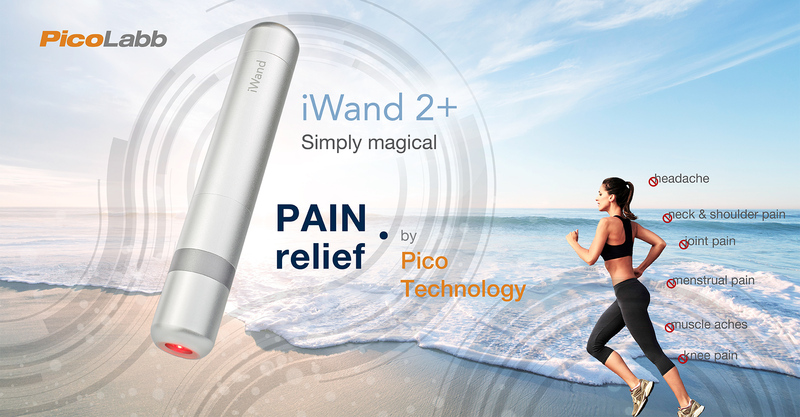 iWand 2+ with Pico Technology improves body fluids and tissue cells to result in faster and stronger microcirculation that maximizes body’s own healing potential, and ultimately restore health. + Watch the microcirculation change with the use of iWand for 10 minutes. Environmental pollution and the stress in living often lead to over-response of the immune system leading to eczema, psoriasis, and subsequent infections. iWand 2+ encourages rapid recovery of wounds and infections, and enhances the body immunity. Use iWand 2+ over the area on which skincare products or ointments have been applied for about 1 minute, the applications will be quickly and deeply absorbed into the skin. Completely safe and reliable to use without side effect ever reported by any users so far. Portable design lets you self-administer healing anywhere, anytime to deliver unprecedented healing power and skin care. iWand 2+ will become the must-have in your bag every day. Durable body design with waterproof rating at IPX7. iWand 2+ fits perfectly on your hand and has over 200 hours of use with the included battery. Regular use helps maintain and improves overall health. Protonic light works effectively on your pet too for regular healthcare including cold, cough, eye disease, vomiting, loss of appetite, etc. iWand 2+ also relieves joint pain, maximizes the pet’s own healing potential, and ultimately restore health, especially beneficial to the health of older pets. The book helps the user for the best use of iWand 2+ to restore body health, relieve pain and prevent illness. A guidebook for major acupoints of our body. The book helps the user to apply iWand 2+ on dogs and cats to relieve pain and prevent illness. iWand 2+ is enabled by Pico Technology.